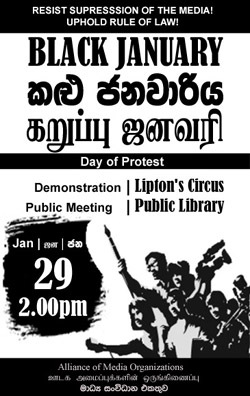 8th March 2008, Colombo, Sri Lanka: The Free Media Movement (FMM) expresses its concern that number of journalists have being taken in for questioning on 7th and 8th of March with some of them held incommunicado for hours. Most of the journalists arrested were associated with www.outreachsl.com, a news and features web site. On the evening of 6th March, E-Kwality printing press owner and writer N. Jasiharan was arrested by the Terrorist Investigations Department (TID) with his partner Valarmathi without any valid reason. His laptop computer and printed material form his printing press was taken in to custody. Jasiharan also works as a writer for http://www.outreachsl.com. On 7th March, the TID arrested the Editor of http://www.outreachsl.com and freelance journalist, J.S Tissainayagam. He was taken in for questioning in the morning, kept incommunicado till family was informed that he has been arrested in late evening. The Daily Mirror website reported today (8th March) that the TID refused to elaborate on what he was being questioned about. He was detained under emergency regulation on 8th for 30 days. Also on the 7th, K. Wijesingha, another reporter of the website was also taken in for questioning, but nothing was heard of him till midnight 7th March. His family was allowed to visit him at TID on 8th. Udayanan, the Visual Editor of the web site too was taken in for questioning on 7th afternoon. No news of him was available till midnight the same day. On 7th afternoon TID came looking for S. Sivakumar (alias Balasubramanium Wasanthan) , Spokesperson of the FMM and Editor of the bi-monthly Tamil language Sarinihar magazine and took a cousin into custody. The FMM was able to negotiate that Sivakumar would be produced at the TID office at 9am on 8th March. On 8th S. Sivakumar and outreach.com cameraman Ranga was taken in for questioning. High officials of the TID assured FMM that no extra judicial methods will be used in questioning. FMM happy to not that FMM spokesperson S. Sivakumar was leased within twelve hours in late evening 8th March. The FMM accepts that law enforcement agencies have a right to investigate leads in the public interest and take appropriate action as stipulated by the law. We also hope that due process will be followed regarding the arrested writers and journalists. The right to retain lawyers at police stations while statements are being recorded and their right to inform family and colleagues as to where they are being questioned are basic rules that have to be followed. We note that these rights are violated more often than not. Maintaining that until proven in a court of law, anyone arrested is innocent and has to be treated as such, the FMM stands for the rights of these writers and journalists and by them as citizens of this country.